Styled after the 1990 & 1991 Chevrolet High Performance trucks! 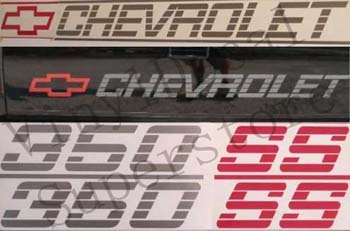 The Chevrolet decal is over 43" long and 4" high. The Bowtie is nearly 11" long and 4" high. 350 SS side decal sizes are 3.1" x 24". You get a pair of side decals. The kit has SILVER 350 with RED SS letters, RED bowtie with SILVER CHEVROLET letters - just like the original lettering. Ask us about custom SS wording and numbering - We have the entire alphabet!